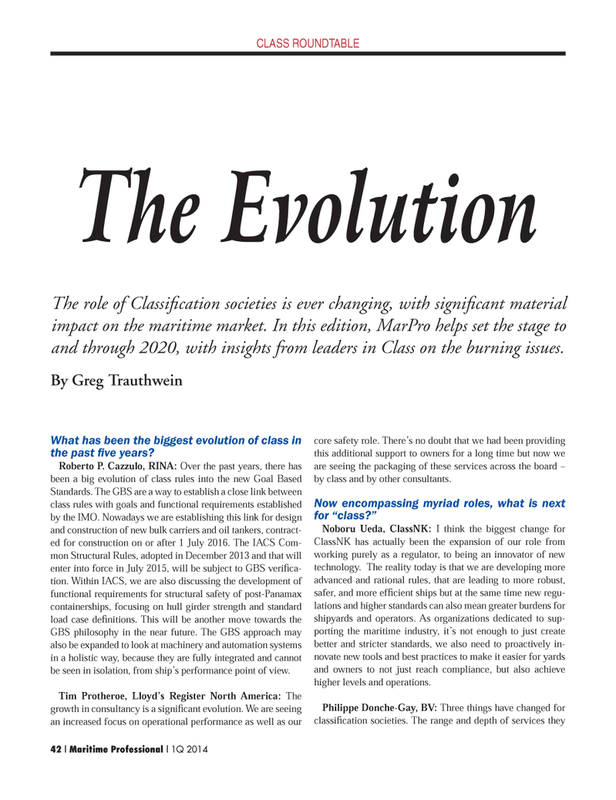 What has been the biggest evolution of class in the past fi ve years? GBS philosophy in the near future. The GBS approach may also be expanded to look at machinery and automation systems in a holistic way, because they are fully integrated and cannot be seen in isolation, from ship’s performance point of view. Tim Protheroe, Lloyd’s Register North America: The growth in consultancy is a signifi cant evolution. We are seeing an increased focus on operational performance as well as our core safety role. There’s no doubt that we had been providing this additional support to owners for a long time but now we are seeing the packaging of these services across the board – by class and by other consultants. ClassNK has actually been the expansion of our role from working purely as a regulator, to being an innovator of new technology. The reality today is that we are developing more advanced and rational rules, that are leading to more robust, safer, and more effi cient ships but at the same time new regu- lations and higher standards can also mean greater burdens for shipyards and operators. As organizations dedicated to sup- porting the maritime industry, it’s not enough to just create better and stricter standards, we also need to proactively in- novate new tools and best practices to make it easier for yards and owners to not just reach compliance, but also achieve higher levels and operations. The role of Classifi cation societies is ever changing, with signifi cant material impact on the maritime market. In this edition, MarPro helps set the stage to and through 2020, with insights from leaders in Class on the burning issues.